Score Attack is a mode in Puzzle & Dragons: Super Mario Bros. Edition. Accessed from the Select World menu, the player must defeat all the enemies in a course within a time limit. After clearing the boss battle at the end, the player earns a rank - D being the lowest, and S++ being the highest - based on how much time they have left, and their high score. Score Attack has three difficulties: Easy, Medium, and Hard, all of which use all Orb types. All teammates use all five attributes and their Skills are maxed out to level 7. When the player updates Puzzle & Dragons: Super Mario Bros. Edition to version 2.0, Score Attack is heavily revamped and these courses no longer appear as standalone courses. The team consists of Boo Mario for the Leader; a Green Koopa Troopa, a Red Koopa Troopa, a Yellow Koopa Troopa, and a Goomba for allies; and Boo Luigi for the Helper. All teammates are at level 25. This difficulty has a grassland theme. There are three battles and one boss battle. The first battle consists of three Spinies, the second battle has a single Ice Bro, the third has a Banzai Bill Cannon, and the boss battle has a Bone Piranha Plant and a Lakitu. To clear this difficulty quickly, the player must utilize Boo Mario and Boo Luigi's Leader/Helper Skills which raise ATK by 2.5x by clearing three attributes or more (with both brothers, this multiplier goes up to 6.25x). The team consists of Statue Luigi for the Leader; a Red Magikoopa, a Blue Magikoopa, a Green Magikoopa, and a Purple Magikoopa for allies; and Rosalina for the Helper. All teammates are at level 50. This difficulty has a beach theme. There are four battles and one boss battle. The first battle consists of a Green Koopa Troopa and a Red Koopa Troopa, the second battle has a single Fire Bro; the third has a Paragoomba, a Green Koopa Paratroopa and a Red Koopa Paratroopa; the fourth battle has a Big Cheep Cheep and a Big Paragoomba; and the boss battle has a 3-Goomba Tower. To clear this difficulty quickly, the player must utilize Statue Luigi and Rosalina's Leader/Helper Skills which raise ATK by 3.5x by clearing four attributes or more (with both, this multiplier goes up to 12.25x). The team consists of Cat Luigi for the Leader; King Boo, Boom Boom, Whomp & Boos, and Bowser Jr. for allies; and Super Rosalina for the Helper. All teammates are at level 90. This difficulty has a sky theme. There are four battles and a boss battle. The first battle consists of a Big Green Koopa Paratroopa, the second battle has Flutter & Flame Chomp; the third has a Big Bone Piranha Plant; the fourth battle has Thwomp & Thwimps; and the boss battle has a King Bill. To clear this difficulty quickly, the player must utilize Cat Luigi and Super Rosalina's Leader/Helper Skills which raise ATK by 5.5x by clearing all attributes at once (with both, this multiplier goes up to 30.25x). When the player updates Puzzle & Dragons: Super Mario Bros. Edition to version 2.0, Score Attack is heavily revamped and has two modes with five courses each: Fixed Challenge and Free Challenge. Fixed Challenge has the player using an assigned team of allies to clear battles as fast as they can - this mode functions the same as the original Score Attack before the digital update. This course is an updated version of the Easy course from version 1.0. The team consists of Super Mario for the Leader; a Goomba, a Red Koopa Troopa, a Spiny, and a Piranha Plant for allies; and Super Luigi for the Helper. All teammates are at level 20. This course has a grassland theme. There are three battles and one boss battle. The first battle consists of three Spinies, the second battle has a single Ice Bro, the third has a Banzai Bill Cannon, and the boss battle has a Bone Piranha Plant and a Lakitu. 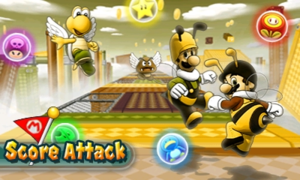 To clear this course quickly, the player must utilize Super Mario and Super Luigi's Leader/Helper Skills which raise ATK by 1.4x by clearing 3 Combos or more (with both brothers, this multiplier goes up to 1.96x). The player has Fire, Wood, Light and Heart Orbs for this course. Clearing this course with an A rank or higher unlocks Rock Mario as a Leader. This course is an updated version of the Hard course from version 1.0. The team consists of Boo Mario for the Leader; a Boomerang Bro, a Fire Bro, a Hammer Bro, and an Ice Bro for allies; and Boo Luigi for the Helper. All teammates are at level 30. This course has a sky theme. There are four battles and a boss battle. The first battle consists of a Big Green Koopa Paratroopa, the second battle has Flutter & Flame Chomp; the third has a Big Bone Piranha Plant; the fourth battle has Thwomp & Thwimps; and the boss battle has a King Bill. To clear this course quickly, the player must utilize Boo Mario and Boo Luigi's Leader/Helper Skills which raise ATK by 2.5x by clearing all attributes at once (with both brothers, this multiplier goes up to 6.25x). The player has all Orb types for this course. Clearing this course with an S rank or higher unlocks Double Mario as a Leader. This course is the Medium course from version 1.0. The team consists of Statue Luigi for the Leader; a Red Magikoopa, a Blue Magikoopa, a Green Magikoopa, and a Purple Magikoopa for allies; and Rosalina for the Helper. All teammates are at level 50. This course has a beach theme. There are four battles and one boss battle. The first battle consists of a Green Koopa Troopa and a Red Koopa Troopa, the second battle has a single Fire Bro; the third has a Paragoomba, a Green Koopa Paratroopa and a Red Koopa Paratroopa; the fourth battle has a Big Cheep Cheep and a Big Paragoomba; and the boss battle has a 3-Goomba Tower. To clear this course quickly, the player must utilize Statue Luigi and Rosalina's Leader/Helper Skills which raise ATK by 3.5x by clearing four attributes or more (with both, this multiplier goes up to 12.25x). The player has all Orb types for this course. Clearing this course with an S rank or higher unlocks Metal Mario as a Leader. The team consists of Cat Mario for the Leader; a Big Bone Piranha Plant, a Boo Crew, a Big Bony Beetle, and Bullet Bill & Goombas for allies; and Dry Bowser for the Helper. All teammates are at level 90. This course has a volcanic Spine Coaster theme. There are four battles and one boss battle. The first battle consists of three Spinies, the second battle has a single Ice Bro; the third has a Banzai Bill Cannon; the fourth battle has a Bone Piranha Plant; and the boss battle has a King Yellow Coin Coffer. To clear this course quickly, the player must utilize Cat Mario and Dry Bowser's Leader/Helper Skills (which raises ATK by 3.5x when clearing 6 Combos with Cat Mario, and an additional 4x when clearing 7 Combos from Dry Bowser -- with both, this multiplier goes up to 14x). The player has all Orb types for this course, excluding Heart Orbs. Clearing this course with an S rank or higher unlocks Gold Mario as a Leader. The team consists of Boomerang Mario for the Leader; Chain Chomp & Flame Chomps, Boom Boom, Red/Green Magikoopas, and Purple/Yellow Magikoopas for allies; and Boomerang Luigi for the Helper. All teammates are at level 99. This course has a Bowser Castle theme. There are five battles and one boss battle. The first battle consists of Larry Koopa, the second battle has Iggy Koopa; the third has Lemmy Koopa; the fourth battle has Roy Koopa; the fifth battle has Ludwig von Koopa; and the boss battle has Dry Bowser. The player has 360 seconds to clear this course. To clear this course quickly, the player must utilize Boomerang Mario and Boomerang Luigi's Leader/Helper Skills which raise ATK by up to 5.5x by clearing all attributes and Heart Orbs at once (with both brothers, this multiplier goes up to 30.25x). The player has all Orb types for this course. Clearing this course with an SS rank or higher unlocks Boomerang Mario as a Leader. Free Challenge allows the player to use whichever team they please to clear battles as fast as possible. This course has a cavern theme. There are three battles and a boss battle. The first battle consists of two Goombas, the second battle has a Dry Bones, the third has three Buzzy Beetles, and the boss battle has two Green Koopa Paratroopas. The player has Fire, Water, Wood and Heart Orbs for this course. Clearing this course with an A rank or higher unlocks Rock Luigi as a Leader. This course has a desert theme. There are four battles and a boss battle. The first battle consists of two Flame Chomps, the second battle has a Boomerang Bro, the third has an Ice Bro; the fourth battle has a Yellow, Green and Red Koopa Paratroopa; and the boss battle has a Sledge Bro. The player has all Orb types on the Orb field for this course. Clearing this course with an S rank or higher unlocks Double Luigi as a Leader. This course has a forest theme. There are four battles and a boss battle. The first battle consists of three Boos, the second battle has two 2-Goomba Towers, the third has a Heavy Para-Beetle; the fourth battle has a Red, Blue and Green Coin Coffer; and the boss battle has a Yellow and Purple Coin Coffer and a Lakitu. The player has all Orb types on the Orb field for this course. Clearing this course with an S rank or higher unlocks Metal Luigi as a Leader. This course has an airship theme. There are four battles and a boss battle. The first battle consists of Blooper Nanny & Babies, the second battle has a 3-Goomba Tower, the third has a Big Bony Beetle; the fourth battle has Bob-omb & Lakitu; and the boss battle has Chain Chomp & Flame Chomps. The player has all Orb types on the Orb field for this course, excluding Heart Orbs. Clearing this course with an S rank or higher unlocks Gold Luigi as a Leader. This course has a Bowser Castle theme. There are five battles and one boss battle. The first battle consists of a Red, Blue, and Green Magikoopa; the second battle has Bowser Jr.; the third has Morton Koopa Jr.; the fourth battle has Wendy O. Koopa; the fifth battle has Boom Boom; and the boss battle has Bowser. The player has 360 seconds to clear this course. The player has all Orb types for this course. Clearing this course with an SS rank or higher unlocks Boomerang Luigi as a Leader. This page was last edited on June 3, 2017, at 13:56.